Can you believe that in all my years of making sweets and baked goods, I never had made Rice Krispie Treats until I came across this amazing recipe on Pinterest for Cake Batter Krispies (what would Messy Jess C. be without Pinterest?) and knew I had to give it a try. 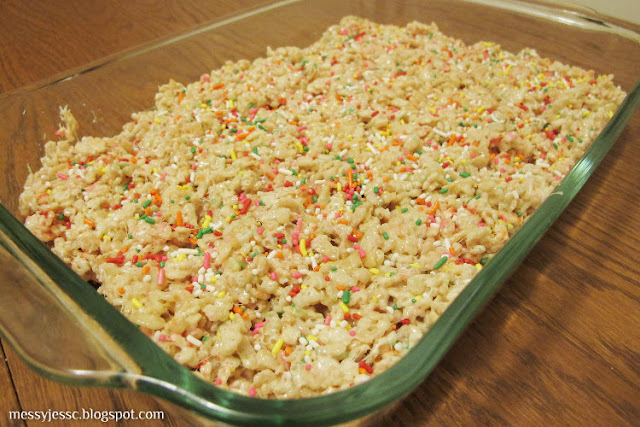 In a nutshell these are Rice Krispie Treats with cake mix added in and sprinkles included throughout and on top to make everything look pretty. Turns out Rice Krispie Treats, even these Cake Batter Krispies, are super easy to make. 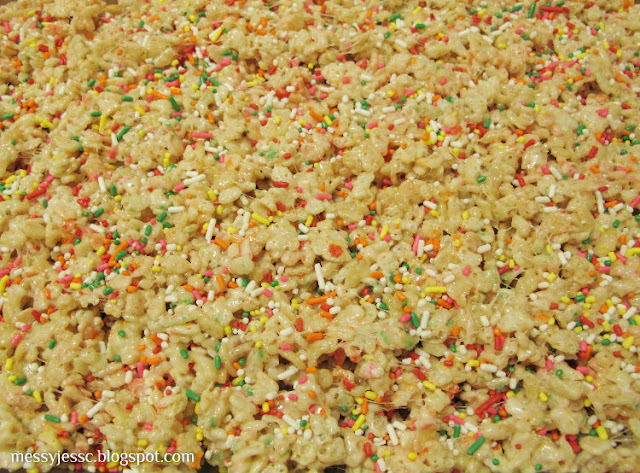 If I had known that I would have been making Rice Krispie Treats for years now, although it's probably better for my diet that I didn't have a clue. First you need a big saucepan to mix everything in. Once you have that in place, melt the butter over low heat. 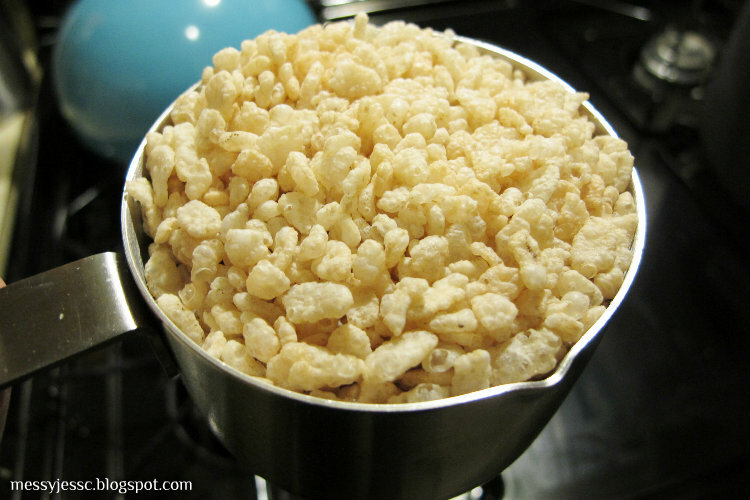 Next add your Marshmallows to the pot. 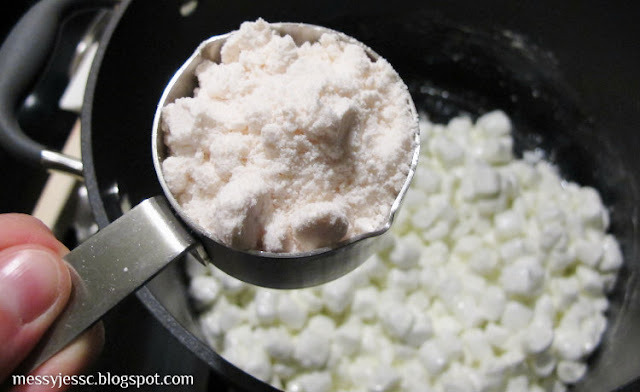 Since I bought a 10.5 oz bag of marshmallows and the recipe calls for a 10 oz. 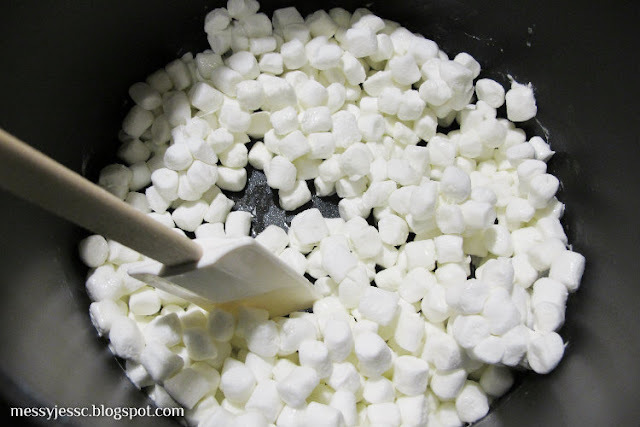 bag, I tested out a few mini marshmallows before adding them to the pot to make sure they were good enough to be included in this recipe. They were. Once the marshmallows begin to melt, add in the cake batter a little bit at a time. 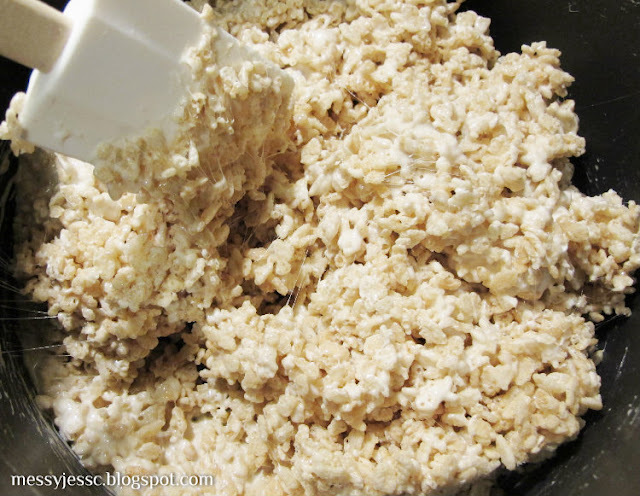 Next, add in the cereal (this is what makes this recipe healthy). 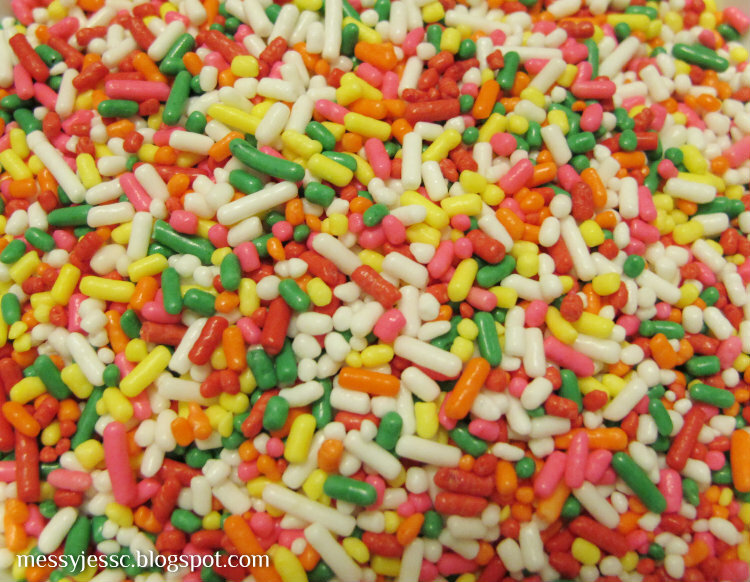 Then, mix in half of the sprinkles. 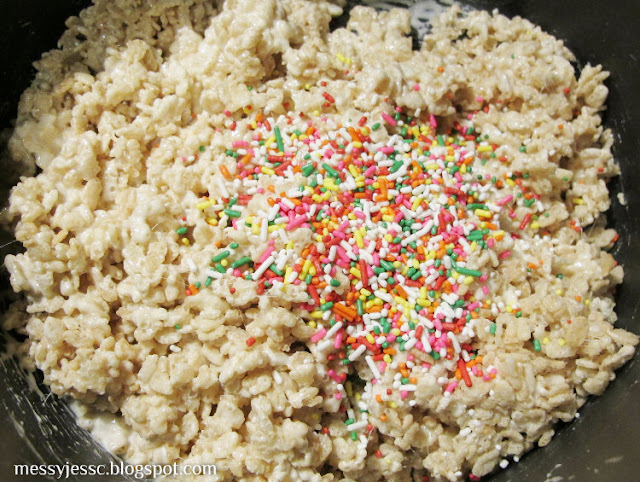 Once the sprinkles are mixed in, press the mixture into the bottom of any dish. 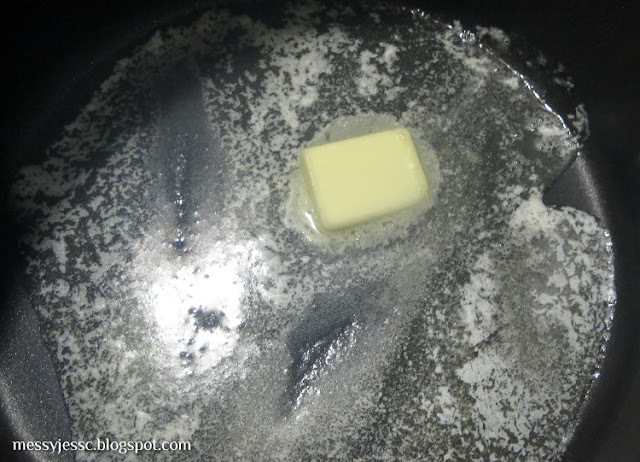 I used a casserole dish. Sprinkle the remaining sprinkles on top of the treats. 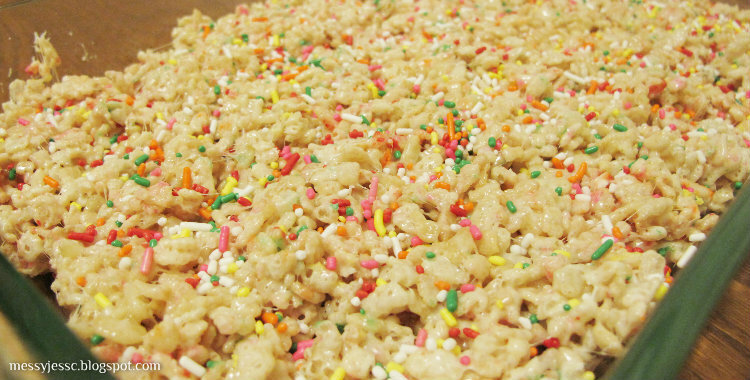 Wait a half hour for the treats to cool and then enjoy! 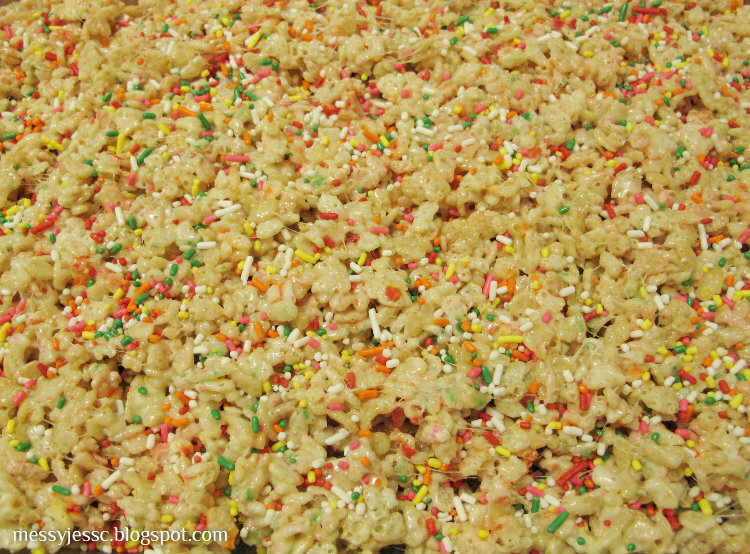 You can find this fun recipe and others on my What's Cookin' page.